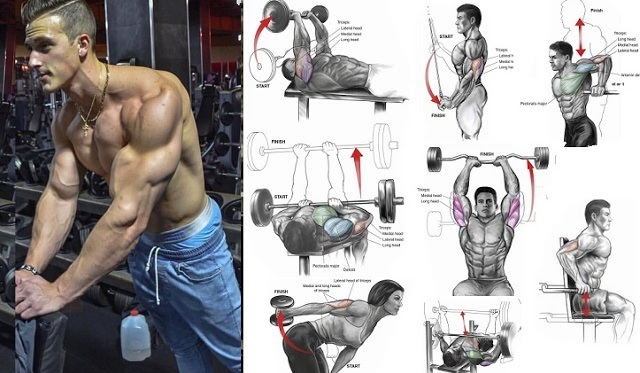 Are you happy with your triceps development? Of course not. That’s a silly question. No bodybuilder is ever completely happy with his arm development. Even the great Phil Heath and Ronnie Coleman, owners of the four best arms in the history of bodybuilding, still train their arms regularly and are never satisfied with them. After checking out the routines of the pros, we narrowed it down to eight primary triceps movements that were most popular for mass. Let’s check them out! Complete them after your regular benching on chest day as a transition to your triceps training. These are probably the best overall movement for adding mass. Wear gloves and use a spotter for safety. Go heavy, but ensure you can always control the weight. Be sure to adequately warm up, as these can lead to injury if heavy weight is used on a cold arm. These are comparable to skullcrushers, albeit a bit safer. Move through this exercise slowly and always control the weight carefully. This movement catches a bad rap, as it’s often associated with spandex bunnies using pink 5-pound dumbbells. Completed with a 35 or 45 pound dumbbell, it’s very effective. Done with a lot of weight, these can lead to a lot of growth. Keep your form tight the entire set, and flirt with higher repetitions if you’re feeling strong. These allow for a much greater range of motion than the standard pressdowns, and can leave you sore for days! These warrant their own movement, as they seem to target the triceps in a manner much different from standard CG bench presses. Give them a shot! If you’re looking to add mass, then your rep range should be on the low end. After completing a good set of 12-15 repetitions to stimulate the slower-twitch muscle fibers and bring blood into the region, it’s time to get to work. Your second set should be 10 to 12 very solid repetitions. Follow that one up with more weight, and work in the 8 to 10 rep range. You can cheat on this movement once you complete the 8th repetition. Finally, end the movement with 6 to 8 repetitions with an even heavier weight. Once you have completed the sixth repetition of that 4th set, it’s cheat time! Use body English, hip swing, or a training partner to drag out a few extra reps. You’ve done your work already, so this is all for bonus growth! Obviously, you’re not going to be using all eight movements in every workout. However, at least three of them should make their way into your weekly routine, and you should use all 8 of them at least once per month. Toss in adequate rest, plenty of food, and a well-balanced training routine, and you should see some serious growth on those triceps in no time!